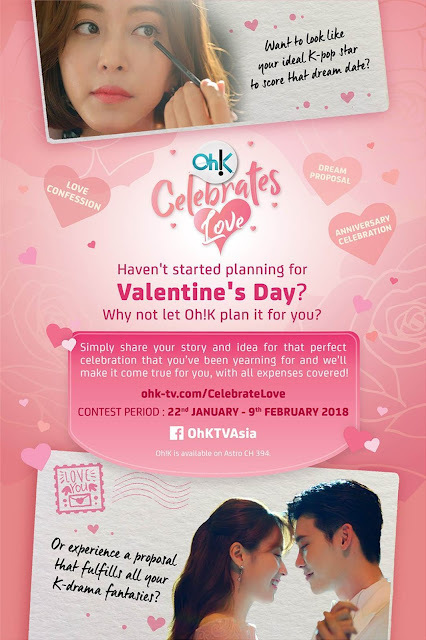 As a lead-up to Valentine’s Day, Oh!K (Astro Ch 394) is launching the ‘Oh!K Celebrates Love 2018’ contest to provide a lucky winner an all-expenses paid celebration. Whether it is a dream proposal, love confession, anniversary celebration or makeover for a dream date, Oh!K will plan that perfect day for one love-struck winner. On top of that, there will also be 10 consolation prizes up for grabs! To join, viewers will need to share their love story and idea for that ideal celebration that they have been waiting for and Oh!K will make it come true! The contest begins today, 22nd January (Monday) until 9th February 2018 (Friday). To find out more, kindly visit this microsite: www.ohk-tv.com/CelebrateLove. Together with this, please find attached and below the official visual for this contest. The promo video is also available at the links below. Feel free to use the visual and videos for your posting.